Manchester United manager Jose Mourinho praised "monster" Paul Pogba after he captained the side and scored the opening goal in the win over Leicester City on the first day of the Premier League season. Pogba - linked with Barcelona this summer - was a surprise starter only four days after his return to training, having won the World Cup with France just under a month ago. 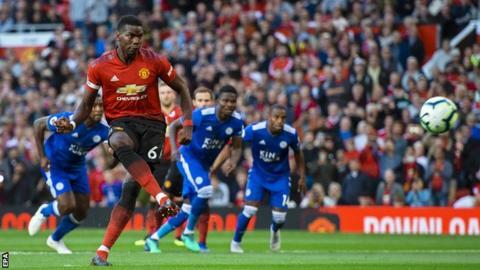 The hosts made a flying start at Old Trafford, winning a penalty in the second minute when Daniel Amartey handled Alexis Sanchez's deflected shot. Left-back Luke Shaw then scored the first senior goal of his career after controlling Juan Mata's aerial pass to double their lead. Substitute Jamie Vardy headed a late consolation for Leicester after Ricardo Perreira's cross had hit a post, and Foxes goalkeeper Schmeichel came forward for an injury-time corner but his header went wide. "Pogba was a monster," said the United boss. "We thought maximum 60 minutes but he managed over 80. "The decision belonged to Paul. I asked him and he made himself available and he was very good." Pogba brought his World Cup form into the opening stages, producing a couple of excellent early passes before the opening goal. A penalty was fairly awarded with Amartey's arm high when he handled - although the video assistant referee was not an option to review the decision, with the Premier League the only one of Europe's top five leagues not using the system this year. Pogba - with two stars shaved into his scalp to celebrate France's second World Cup win - had a brief word with Alexis Sanchez before deciding to take the kick himself. After an unusual staggered run-up, he scored, although his celebrations were muted. He has now scored in his last two games - his previous match being the World Cup final when he was on target in a 4-2 win over Croatia. By the time he was replaced by Fellaini in the latter stages, at 2-0 up and seemingly safe, he had touched the ball more times and played more passes than any of his team-mates. He came off to handshakes from the bench after a good job well done. "I didn't have any pre-season games, I came back on Monday so it was very hard for the legs," said Pogba. "Winning the World Cup is in the past. I like challenges, I want to progress and win more trophies." Can you name the first scorer in the past 10 Premier League seasons? How did United's unfamiliar faces do? United got their season off to a winning start but their performance, after a promising opening, left plenty of questions unanswered. Mourinho has appeared grumpy all summer after failing to sign any of his centre-back targets - including Leicester's Harry Maguire, who played the full 90 minutes at Old Trafford. The Red Devils fielded an unfamiliar back four, with Eric Bailly and Victor Lindelof - who played a total of 99 minutes together last season - in the centre and Shaw and Matteo Darmian on the sides. Both centre-backs did well to deal with the threat of bustling Leicester forward Kelechi Iheanacho, although Darmian was given a torrid time by Demarai Gray in the first half. Shaw took advantage of his chance with his first goal since England Under-17s' 4-0 win over Lithuania in 2011. He took on Mata's high pass, beat Ricardo and then poked the ball beyond Schmeichel. "Luke's game was very complete, even if I forget the goal," said Mourinho. "He made maybe one mistake defensively in the whole match and the linesman could have helped him with a free-kick. He just has to keep going." Shaw - who has had a difficult time at United - said: "I don't want to speak too soon after one game but I want to be up there with the best left-backs in the world. I have the foundations to do that here with the manager and my team-mates." Fred, a £47m signing from Shakhtar Donetsk, was United's only debutant and looked solid - with passing accuracy of 92.3% - although he was booked for fouling James Maddison. He was partnered in midfield by fellow Brazilian Andreas Pereira, who also turned in a steady performance on his first Premier League start. Marcus Rashford started up front, with Romelu Lukaku on the bench, although he did not have a single touch in the box or attempt a shot. Foxes boss Claude Puel was thought to be in danger of being sacked this summer, but the club's owners instead backed him in a £100m spending spree. Maddison, a £20m recruit from Norwich after 14 Championship goals last season, looked good in the first half - playing plenty of passes in dangerous areas, as well as testing De Gea from 16 yards out. Ricardo was also bright before the break on the right wing - and had a shot saved by the United keeper, before having a hand in Vardy's late goal. Another debutant, Rachid Ghezzal - Riyad Mahrez's summer replacement - came on in the second half, as did goalscorer Vardy. Vardy's England team-mate Maguire was solid at the back for Leicester but unable to cause any of the mayhem he unleashed at the World Cup in the opposition box. Where he failed, Schmeichel almost succeeded when he headed Ben Chilwell's corner just wide. Only five goalkeepers, including Kasper's father Peter, have scored in the Premier League. Former United boss David Moyes on BBC Radio 5 live: "If you were picking the fixtures for United in the first nine or 10 games, you're not playing City, United, Chelsea. I wonder with Jose's words the other day - 'let's wait until November' - I'd be very surprised if United weren't top of the league come the end of November." Leicester boss Claude Puel to BBC Sport: "It was a good game, a good performance from my team. Certainly we lacked more energy in the second half. That's normal for the first game. "We conceded an early goal, it was harsh. It was not a good result but it's a good performance. We gave our best against a great team. We deserved a different result - we deserved a minimum of a draw." Manchester United have won on the opening day in each of their past four seasons, their joint-longest run in the Premier League (also four in a row between 2000-01 and 2003-04). Leicester are winless in their past 16 away top-flight matches on the opening day of the season (D8 L8) since a 3-2 win at Aston Villa in August 1933. United have won eight of their past nine home Premier League games against Leicester (D1), winning all three under manager Jose Mourinho. Mourinho is unbeaten in all 18 of his opening league matches of a season as a manager (W11 D7), winning nine of his 10 in the Premier League (D1). Pogba has scored in 11 Premier League games and ended on the winning side in all of them - a joint record he shares with former Liverpool player Ryan Babel. Leicester have conceded the first goal of the Premier League season in each of the last three seasons, also doing so in 2016-17 against Hull City and 2017-18 against Arsenal. Pogba's goal inside three minutes was Manchester United's fastest goal scored in a Premier League season opener - the previous fastest was Dwight Yorke after seven minutes against Everton in 1999-2000. Shaw registered his first senior goal in his 134th appearance in all competitions (67 games each for Southampton and Man Utd). Vardy has now ended on the losing side in four of the past five Premier League matches in which he's found the net (W1). United go to Brighton next Sunday (16:00 BST) in the second round of games, with Leicester hosting promoted Wolves on Saturday (15:00 BST). Attempt saved. Demarai Gray (Leicester City) right footed shot from the centre of the box is saved in the centre of the goal. Assisted by Jamie Vardy with a cross. Who will be Premier League champions?